The most damaging charge laid against Lloyd George has always been that he was merely an opportunist. But contemporary trends in historiography are strongly against the idea that any politician can be satisfactorily viewed purely as a pragmatist whose only concern is power. 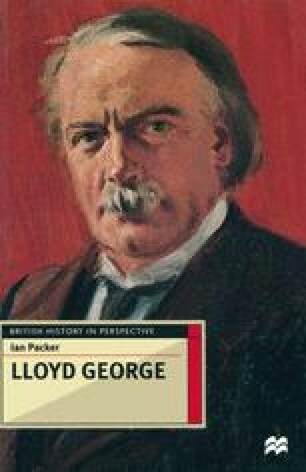 In recent years, historical inquiry has increasingly focused on unravelling the preconceived ideas and attitudes that underlie political action, and serious attention has been paid to the ideology of even such seemingly unpromising figures as Stanley Baldwin.1 Lloyd George, though, represents a huge challenge to this approach. His career was so complex and protean that almost any assertion about his approach to politics can be contradicted by reference to some part of his life. There have, though, been attempts to place Lloyd George in a consistent frame of reference, notably by Ken Morgan and Martin Pugh.2 Morgan tended to see Wales as the most important thread in Lloyd George’s career. More recently, Martin Pugh has described Lloyd George as part ofa centrist strand of politics, stretching from Joseph Chamberlain to David Owen, which in combining a commitment to social reform with a robust foreign and imperial policy does not fit easily into the party system.